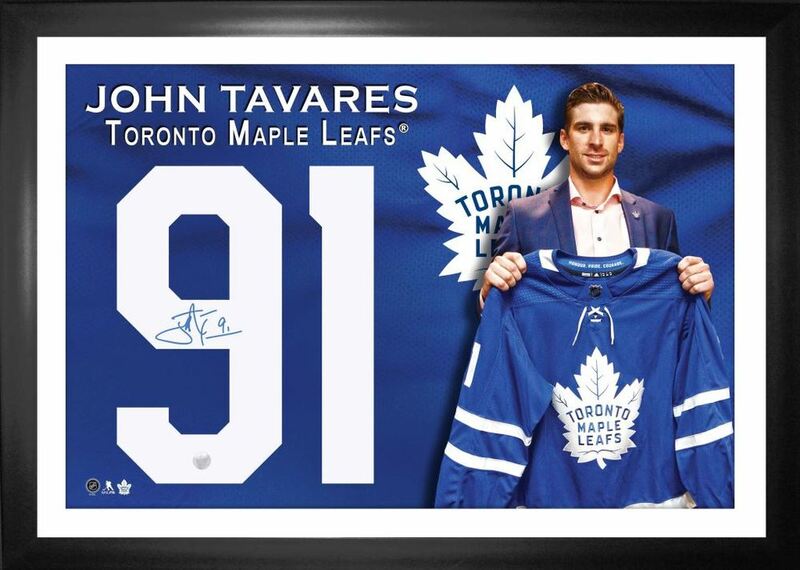 This framed number has been personally signed by Maple Leafs All-Star, John Tavares. Tavares signed with the Maple Leafs during the 2018 offseason after spending 9 years with the Islanders. Tavares grew up in Toronto and was ready to make his trip home to play with his favourite team growing up. Tavares was drafted first overall in the 2009 NHL Entry Draft. Tavares' ability to play in all areas on the ice has led to his dominance and making him a franchise centermen. Tavares made the All-Rookie Team in 2010, and NHL First All-Star Team in 2015. Tavares has played in 5 All-Star Games. Frameworth is the exclusive provider for John Tavares signed memorabilia. This NHL and NHLPA licensed product comes with a Frameworth COA and hologram to ensure the authenticity of the autograph.